I hate bugs. I hate ’em hate ’em hate ’em. I’d like nothing better than to crush the life out of them when they come near me, but unfortunately, they also give me the screaming heebie jeebies, and I’m left standing on a chair until someone else comes along to do my crushing for me. Partly for these reasons, I enjoyed Pocket Ants. This very simple bug sim let me work out some of my frustration towards insects without actually letting them anywhere near me. 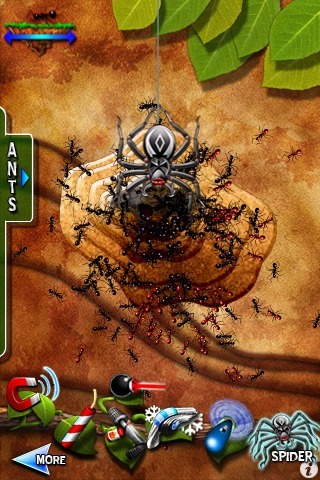 For the most part, Pocket Ants is just a basic bug smashing game. Unlike the more robust and similarly named Pocket Frogs, Pocket Ants doesn’t give you much to do beyond letting you randomly descend and wreck havoc on the ant hill when you feel the need for some carnage. But rest assured, it gives you lots of options for carnage. You have control over a lone ant hill populated by black ants which is occasionally beset by invading red ants. You can adjust details like the population and aggresiveness of the red ants, and once you have your ant levels to your liking, then the fun can start. 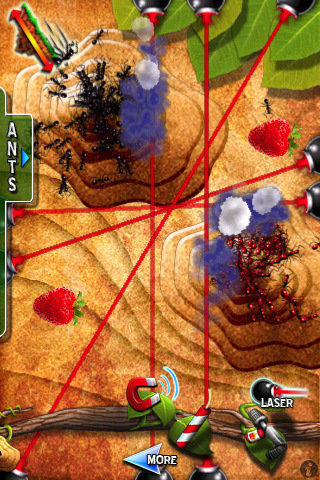 Pocket Ants provides a very well-stocked arsenal for full on ant warfare. There’s your standard magnifying glass and rocks, but there are also improbably high tech options, like landmines, freeze guns, and lasers, as well as environmental effects, like a storm you can call in to flood the little creeps out or shaking your phone to create an earthquake. If you’re so inclined, you can also feed or race them, but the main focus is on smashing as many as your heart desires. As in nature, there’s basically an unlimited number of ants, so you never really win; you just take solace in making their lives more miserable than yours. Without a doubt, this is a particularly mindless diversion in the frequently empty-headed app world, but I won’t deny that there’s a certain visceral pleasure to it. OpenFeint integration gives a ton of achievements to unlock, but most of these are going to be fairly trivial, like burning an ant with the magnifying glass. Let’s face it, this is ant killing, not rocket science. All things considered, despite the rather stupid premise and minimal long term appeal, it’s not a bad little app. It has fairly decent graphics and large range of basic interaction. Don’t set the bar too high, and you’ll probably get a mild kick out it, and who knows? Maybe killing ants will become your new Zen fix when you start feeling trapped in by the walls of your cubicle. AppSafari review of Pocket Ants was written by Tracy Yonemoto on December 3rd, 2010 and categorized under Action, App Store, Games, iPad apps, Line Drawing, Mini Games, Physics Based, Racing. Page viewed 4163 times, 1 so far today. Need help on using these apps? Please read the Help Page.